In anticipation of the return of “Downton Abbey” to MASTERPIECE, beginning January 4, 2015, on PBS, Martha Stewart and her team have created a “Gingerbread Abbey”—a stunning likeness of the Grantham family home made entirely of gingerbread. Knowing that Martha Stewart was a huge fan of the show, and the expert on gingerbread house-making, PBS invited Martha and her team to take on this baking challenge. 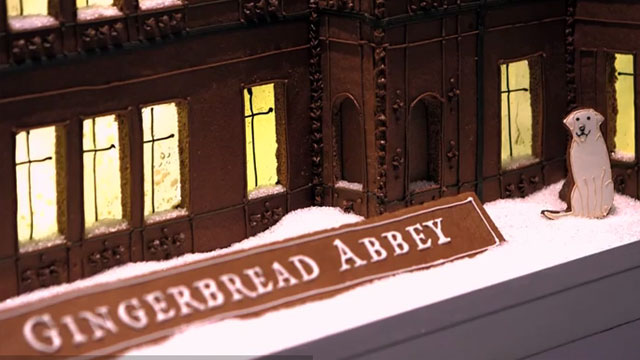 To engage Martha’s fans and fans of “Downton Abbey,” Martha is encouraging others to share their Downton-inspired creations throughout the rest of the holiday season using the hashtag #GingerbreadAbbey. Martha invited “Downton Abbey” cast member Lesley Nicol (“Mrs. Patmore”) for a special preview of the “Gingerbread Abbey” and a tour of the Martha Stewart kitchen in New York City. Martha Stewart’s “Gingerbread Abbey” took two bakers from her team 34 hours to decorate and two hours to assemble. The structure features 65 caramel windows and required 66 cups of flour, 22 eggs and 11 cups of molasses to create. Fans can view video of the abbey here. In addition, Martha and her team have created a series of videos that demonstrate how to make and assemble a gingerbread house, which can be found at MarthaStewart.com. Related content will also be available on the PBS Food site. In addition to being a “Downton Abbey” fan, Martha Stewart is a member of the PBS family. Her popular shows “Martha Stewart’s Cooking School” and “Martha Bakes” air on PBS stations nationwide.